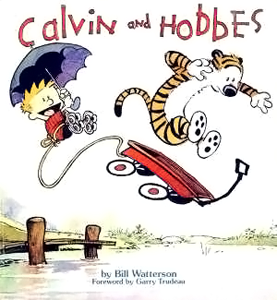 Calvin & Hobbes, always on an adventure! A new genre adventure is about to begin! 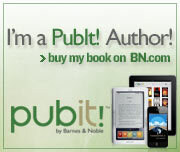 As some of you know, to date I’ve published 3 books in 2 genres. I have two “cozy adventure” treasure hunts (what that means is that they’re clean and fun, and you don’t have to worry about anything embarrassing or gross) called Solomon’s Throne and The Hoard of the Doges. 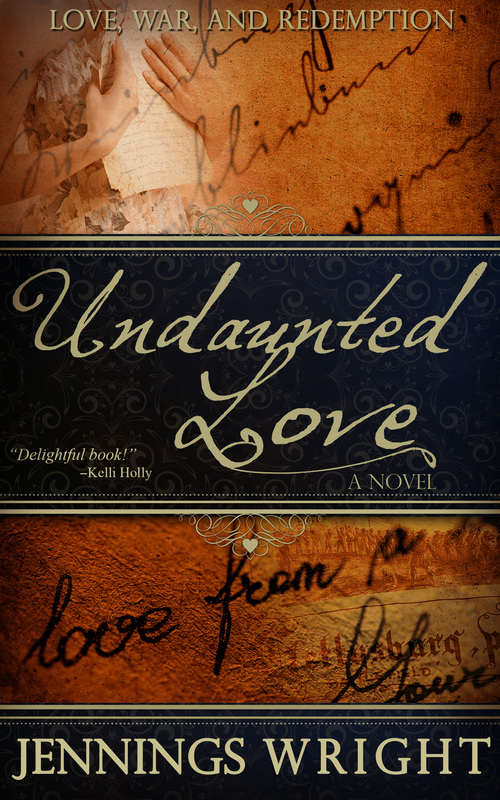 I also have a Christian historical romance set in the Civil War that’s also a mystery. It’s called Undaunted Love. But now (maybe even today — we’ll see!) I am about to set off into a whole new genre: Young Adult sci-fi fantasy. With a lot of dystopian and a little romance thrown in. I’m really excited about IXEOS and the two books that will follow, IXEOS: Rebellion (April) and Darian’s War (June). I have had a complete blast writing them, for one thing, and I think the plot is fun, unique and interesting. There are lots of characters doing really cool things and trying to save the world. That’s what we all really want, isn’t it? To be the one to save the world? Neahle McClelland. Neahle is 18 when she gets lured to Ixeos, and she doesn’t feel like she has any special talents to offer the outsiders. She does feel like she might have something to offer the young French rebel leader, Gilles, though. Clay McClelland. When Clay arrives in Ixeos with his sister Neahle and his cousin Marty, he’s not excited by the adventure. He’s just plain mad. But he soon finds out he has a big part to play in freeing Darian, the rebel leader who’s been in prison for fifteen years. Marty McClelland. When it came to looks, God didn’t take a lot of time on Marty, at least in comparison to his cousin Clay. But He made up for it in brains, because Marty is a primo hacker. When he finds out he can hack to his heart’s content on Ixeos, he thinks he’s in heaven. His fellow computer geek Marissa isn’t so bad, either. Abacus & Vasco. These brothers were the first to arrive in Ixeos from Earth and are the leaders of the outsiders. Abacus is the planner and commander-in-chief, and Vasco is the adventurer. Together they’ve been fighting the Firsts and helping the rebels for over twenty years. Landon. Landon is the man who got all the outsiders into this mess to begin with. No one knows how he brought them to Ixeos, but they sure know he won’t let them go home. With mysterious powers and a mission to free Darian and drive out the Firsts, he is the sole recruiter of his reluctant outsider army. 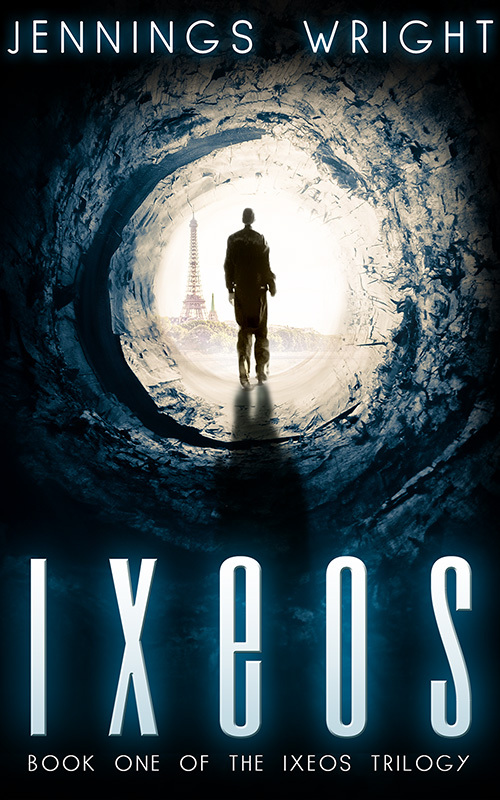 The situation on Ixeos is dire: a humanoid alien race has taken over the planet, killed most of the humans and enslaved the rest. Small pockets of rebels inhabit the cities, but on their own, they can’t defeat the Firsts. Landon has brought teens from Earth to help, and with this ragtag army they will free Darian or die trying. The book will be out this week — I hope you’ll pick up a copy and let me know what you think! The Giveaway ends on Friday! NaNoWriMo – Is it all fun and games? I’ve written much here about the NaNo detractors, and the fact that most people doing NaNo (my totally made up number is 80-90%, based on reading the forums) are doing it just for the challenge, the same way others try a 5k race or a marathon, or to read a book a week for a year, or any other challenge that strikes their fancy. So detractors, just back off and chill! Ever heard of fun?? For those who might question the quality, I’ve recently discovered Grammarly. I’ve been putting my most recent (August Camp NaNo) book through it a chapter at a time while it’s out with beta readers, and my average grade, using the “creative” filter, is 90%. And most of the “problems” are in dialogue, so really I’m averaging about 95%. All of that to say, I spend many more hours editing than writing, and try to produce a top-notch book. On that note, here’s The Hoard of the Doges. It’s actually the first one I’ve published that’s NOT a NaNo novel, although I wrote most of it in a month using the NaNo format. 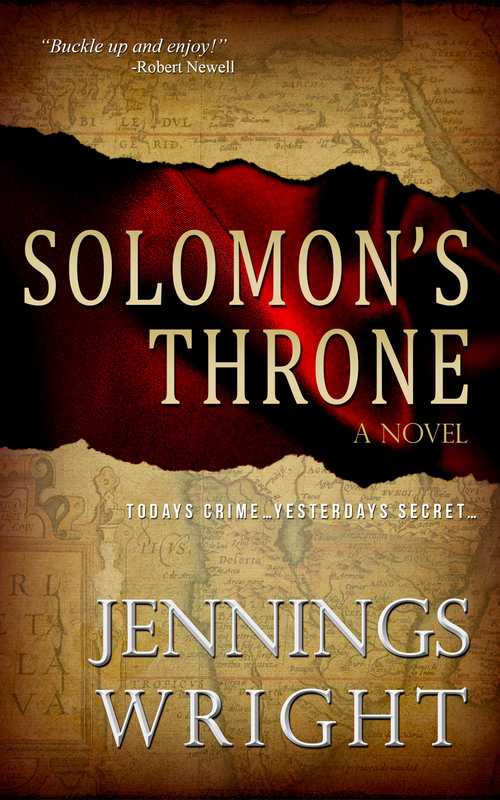 It’s the sequel to Solomon’s Throne, but it stands alone if you haven’t read the previous book. I think it’s really fun, and love writing with the Quinns and Mac. I hope you’ll read it and enjoy! When her boss finds an Old Master painting buried under centuries of junk in a Venetian cellar, restoration specialist Rei Quinn is over the moon. When she gets kidnapped and the ransom demand is the painting, her enthusiasm understandably wanes. Along with her husband, security specialist Gideon, and their pilot friend Mac, the Quinns discover and decipher a map encoded in the painting. Taking off for Venice and her bygone territories, they begin the search for a treasure hidden since the Crusades. Hot on the trail are members of an ancient crime family, determined to finally claim the Venetian wealth. 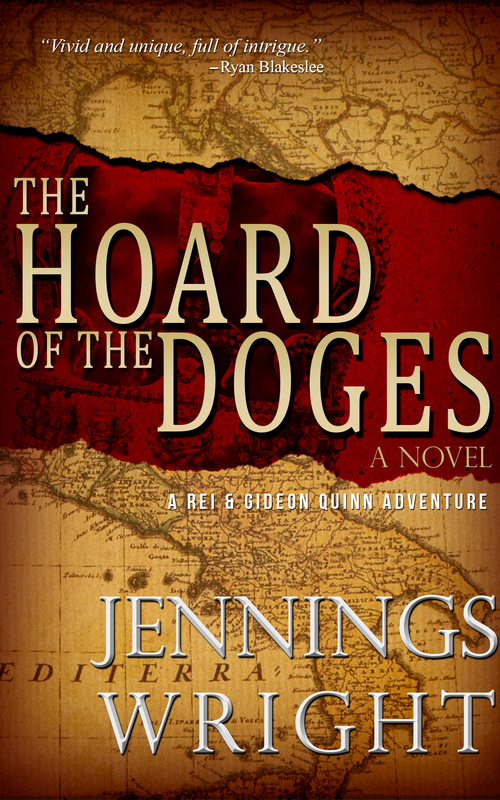 Who will be the first to find the hoard of the Doges? 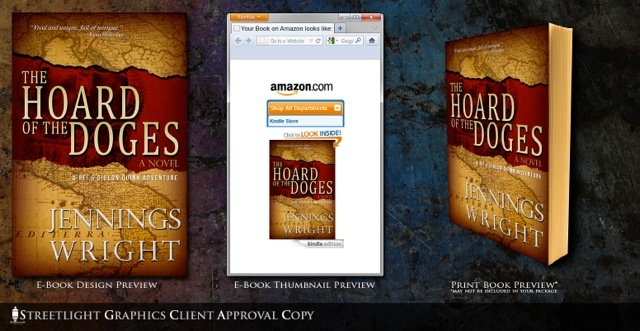 The Hoard of the Doges is a fast paced adventure, whisking the reader back to Venice in the Middle Ages and forward to the Greek Isles and beyond. The map is of Italy, as the story centers around a treasure hoard of the Doges of Venice in the Middle Ages. There is a crown in the red slashed section, done in shades of gray. I think the book will be online and in print next week! How exciting is that?! So in the meantime, you can download your FREE copy of Solomon’s Throne to your Kindle this weekend, Friday-Sunday. That’s the first Rei and Gideon Quinn adventure, so be sure to check it out!